The movie season is starting to heat up and almost every week there’s at least one major release heading to theaters. Last week, that movie was Shazam!, which went on to claim a nice $53.5 million at the box office. This weekend, Hellboy and Little are stepping up to the plate to get that No. 1 spot, but it looks like neither film will top Shazam! 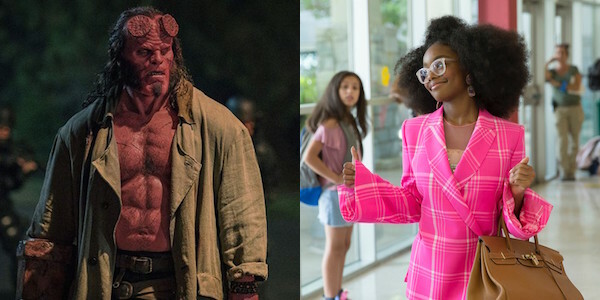 Based on late Friday estimates, per Deadline, Hellboy will gross around $12.3 million for the weekend. It’s a disappointing number for the comic book movie, which was projected to open in the range of $16 million to $20 million. The film was made on a $50 million budget. Comparatively, the first Hellboy movie opened with $23 million in 2004. Fans of Hellboy have long awaited the release of a third installment, but the new film is a reboot that ignores the continuity of the previous films. Guillermo del Toro was not involved with the reboot, which was directed by Game of Thrones alum Neil Marshall. Coming out of the gate, Hellboy received largely negative reviews, currently sitting at a 15% on Rotten Tomatoes. Additionally, the film reportedly wasn’t widely available to the press prior to release, which is typically not a good sign. Hellboy also has a “C” CinemaScore from polled moviegoers. Meanwhile, Little, the body-swap comedy that stars Regina Hall and Marsai Martin, is currently sitting at an estimated $14.9 million opening. That falls much more in line with initial opening projections of $14 million to $18 million for the film. Little has gotten mixed reviews, but not so drastically that it’s affected audience turnout at the theater. The comedy sits at a solid CinemaScore of B+. The movie cost $20 million to make, so things are looking positive for the comedy. On the other end of the box office spectrum, the stop-motion-animated Missing Link is almost completely missing in action. Box Office Mojo suggests its opening weekend is unlikely to top $6 million. What the heck happened there? When the weekend box office reports come out tomorrow, Little may end up in second place while Hellboy opens in third place. However #2 and #3 turn out, Shazam! is expected to stay the No. 1 movie at the box office. The fun superhero movie, which scored positive reviews, is expected to make about $23.4 million this weekend, based on Friday projections. That would brings its total domestic box office run up to just over $93 million. The worldwide total is currently just over $200 million. With a sequel already in the works, this is another win for the DCEU, though perhaps not as extreme as Aquaman was. We’ll see if Shazam! can hold on to first place for three weeks in a row because, after that, Avengers: Endgame hits theaters. That would be the single greatest upset in cinema history if Shazam! beat that film. You can check out all of these movies in theaters right now if you want to share a little support. For everything else arriving this year, check out our handy 2019 movie release guide.